The SD Video Codec Companion Solution enables flexible multi-standard de- and en coding at very low silicon cost and extended battery life at the same time. It supports the widest range of video encoding and decoding standards plus value-add image/video processing features and is field-upgradeable for extended product lifetime. 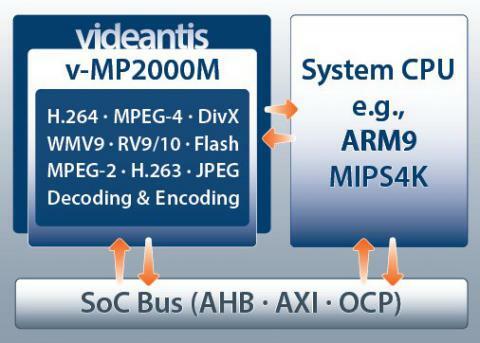 Easy system integration of the SD Video Codec Companion Solution is facilitated through a generic interface to industry-standard bus systems and a generic memory interface to the system CPU. Coming with a fully optimized application suite and comprehensive integration support, the SD Video Codec Companion Solution is truly a one-stop solution for cost-sensitive video communication and playback devices.